This tech blog is a revision of the Introduction To Networking blog post, only updated for use with GameMaker Studio 2. In this blog we're going to give a brief overview of what networking is and how it can be achieved in GameMaker Studio 2. It is worth noting that to accompany this tech blog you can get a simple LAN Platformer Demo from the YoYo Games Markletplace. This demo shows the concepts that we'll discuss being used in a real game for you to study and learn from. To start with, let's talk about sockets. 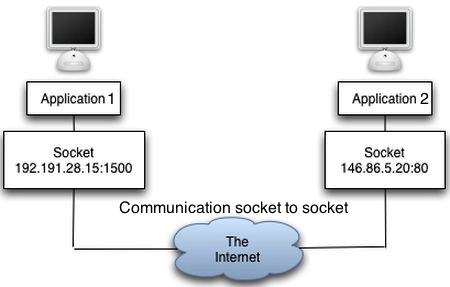 The actual definition of a socket is "one endpoint of a two-way communication link between two programs running on the network", so for a game being run on two different devices to talk to each other, each will need to have a socket connected to the other. We'll be doing this initially using TCP/IP connections, which is what the internet is based on (IPv4 to be more precise). This in essence will let you connect one socket using an IP address (let’s say 192.168.1.10) to another socket on another IP address (say 192.168.1.11). 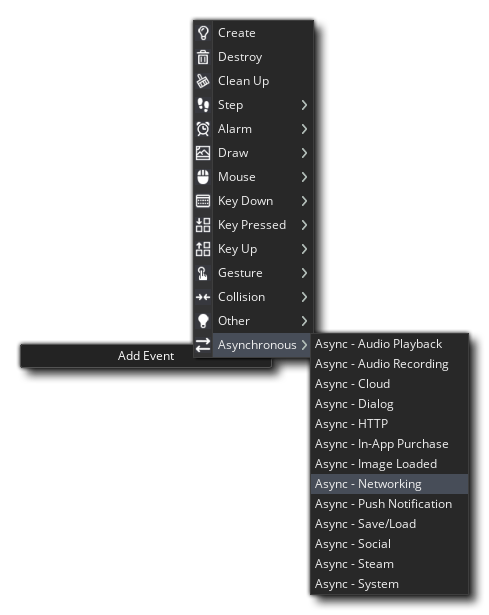 Once connected, the two sockets can send data back and forth using the network_send_packet() function and the Network Asynchronous Event in GameMaker Studio 2, but we’ll get more into that later in the tech blog. Note: Sockets and networking are available on all platforms excluding HTML5. IP addresses also have what are called ports. Instead of programs having to read and deal with every bit of network traffic coming into a device, IP addresses are linked with ports which are given a value ranging from 0 to 65535. This allows each program to "listen" to only a specific port number to get just the packets that are relevant to it, and not everything that's coming in. This saves considerable CPU time, as it seriously cuts down on data processing. One thing you should note though, is that some ports are already in use by your system, and so you should try to pick an appropriate port number for your sockets. You can see a general list of port values and their uses http://en.wikipedia.org/wiki/ListofTCPandUDPportnumbers. Once the link has been established the game can then freely send data back and forth. Async Events are an event category that has no fixed position in the regular order of events, and the events in this category will be triggered at any time if any incoming data is received. In the case of networking, there is a specific Asynchronous Network Event that will be triggered when a connection or disconnection is detected or when incoming data is received. What this means is that a game can send data out from any event at any time, but that all incoming data must go through the Async Networking event, for both client and server. This means that we need to use our Networking event to find out what the incoming data is for and what it contains, then act accordingly. Before continuing it's worth noting that GameMaker Studio 2 will do a few things in the background when you are receiving data over the network. Generally, sockets send data “streams”, meaning that if a device sends 5 data packets over the network to a server, the server may end up getting only one single block of data comprised of all 5 packets "merged" into one. So rather than 5 callbacks of 32 bytes, you get one callback of 160 bytes. This can make networking a bit more complicated, but thankfully if you are using the network_send_packet()function, then GameMaker STudio 2 will automatically split these combined packets up. What GameMaker Studio 2 does is attach a small "header" to each packet sent so when it is received it knows it’s a packet, and its size, and will trigger a separate Async event for each one so you can process it individually . So, exactly how should you write a simple networked game? Well, there’s obviously an infinite number of ways, so we’ll pick a very simple example, and discuss that. For our system, we’ll run the whole game on the server, leaving the client to just display the results. The “32” is the total number of clients we want to allow to connect at once. This number is arbitrary for the demo, but note that with too many connections your game will saturate the network or your CPU won’t be able to handle the processing of that number of players, so set this value with care. Note that if creating the server fails, then it may be that we already have a server on the device, or that the port is in use by another program. Only one socket can listen to the same port at once, so if something else is using it, then you’ll need to pick another. you can add in some error handling code here to loop through a set of port values (for example) or simply not connect and run the game offline. NOTE: “127.0.0.1” is a special network address that is ONLY your device. It’s a “loopback”, meaning nothing actually goes out on the network, but is instead delivered directly back to your own device. This can be changed later if required. And that’s it for setting up the client and server sockets! We are now ready to send data back and forth between them. This creates a new buffer 256 bytes in size, that will grow as needed, with an alignment of 1 (no spaces left), which - for our minimal traffic - is just fine. NOTE: We recommend you don't create and destroy the buffer for each package, but rather create the buffer once and then keep it around so that you can reuse it. Keep in mind that you'll need to reset the read/write position back to the start each time (see buffer_seek() in the manual for more information). To send some data to the server we simply have to write it to the buffer, and send it. And that’s it. The buffer_seek() at the start sets the buffer write position to 0 and then we write some data: first a constant to tell the server what type of data the packet contains, and then a string with the player name - and then we send the buffer packet out over the network. The Async Network event creates a new ds_map and assigns async_load to hold it, and this allows us to look up everything we need, and this lets us decide on the current course of action. Here we get the unique socket ID of the socket that threw the networking event. This can either be the server ID, or an attached client ID. If it’s the server ID then we have a special connection/disconnection event type being triggered, and it’s at this point that we can start creating new players for the attaching client or throwing them away if they disconnect. Now when a client is connected, we store the socket ID along with the instance ID in the DS map, and now, whenever some incoming data arrives from the client, we can simply lookup the instance using the incoming socket ID and then assign the data as needed. // translate keypress into an index for our player array. The last part of this puzzle is sending out updates to the connected clients, and have it update the game. Again, this is handled through the Async Network Event, and the only difference is that we want to handle it in the client controller object. In the case of the demo that this tech blog is based on, all the client will do is receive the data from the server and use that to draw all the sprites. NOTE: The server Step Event will sending out this data every game frame, for all the attached players and active enemies. This keeps it simple for the sake of learning, and is actually fine for a small LAN game, but when you expand to a game over the internet this is not the most efficient or workable way to do it. However, that's outside of the scope of this tech blog. Now that we have something to draw, we can draw this inside the *oClient Draw Event in a simple loop, and if you check the demo project you can see this being done (and note that the player and enemy objects have their own draw events suppressed with a comment so they aren't drawing twice). oClient: The client is a "dumb" client that simply sends key presses/releases to the server, and it will also draw all the sprites from the data that the server sends back. oServer: This is the main controller. It will connect/disconnect clients, create new players as they come in (mapping them to a socket id), and send out all sprite data to all connected clients. 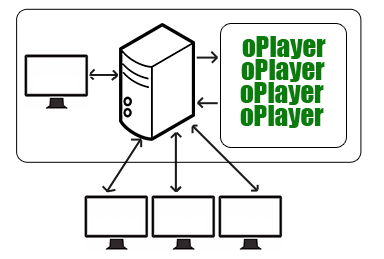 oPlayer: The player object is pretty much the same as you'd have in any offline game, except it no longer checks keys directly, but instead checks an array of keys that the server fills in when it gets key press data from the client(s). Once you have this framework set up it should be relatively easy to expand it to cover other pieces of data, like item pickups, or health, etc... We suggest that you take the Demo that accompanies this tech blog and use it to experiment and add things to. You'll quickly find that basic networking isn't so difficult after all.